NEVER AGAIN. Journalist Raissa Robles says her new book is a ‘study of a benevolent dictatorship,’ and recounts stories of atrocities during the Marcos regime. MANILA, Philippines – Thirty years since the historic uprising that overthrew the late dictator Ferdinand Marcos, a new book aims to recount the atrocities of the Marcos regime and bring to light stories of torture and repression. In “Marcos Martial Law: Never Again,” journalist Raissa Robles presents a brief history of the human rights violations committed during the late strongman’s authoritarian rule. In her book, Robles provides not just stories of torture, but explains how and why Marcos declared martial law. During the book launch on Tuesday, February 23, Robles said the book aims to remind Filipinos of the atrocities that other generations have already forgotten, and to uncover more stories of cruelty. Robles recalled the story of one young woman, who had been raped and treated as a “comfort woman” by a military officer. “We never knew the extent of the repression. There were times when I was doing the research here that I cried, because I could not imagine so much cruelty done by one Filipino to a fellow Filipino,” she said. Describing it as a “study of a benevolent dictatorship,” Robles said the book also aims to serve as a “warning” about the costs of giving up one’s freedom. The launch of the book comes two days before the Philippines marks the 30th anniversary of the historic EDSA People Power Revolution that ended the Marcos dictatorship. It also comes ahead of the national elections in May, where the late dictator’s son, Senator Ferdinand “Bongbong” Marcos Jr, is running for vice president. Based on a recent Social Weather Stations survey, Marcos has promising survey numbers. He is currently tied with Senator Francis Escudero for the top spot in the vice presidential race. Of the 52 million registered voters for the May polls, around 20 million come from the youth sector – a generation that has not seen or experienced the horrors of martial law. During the book launch, Robles dismissed suggestions that the timing of the book’s release had a political motive. “The timing was accidental. I should’ve released it much earlier, when I realized the memory was fading,” she said. 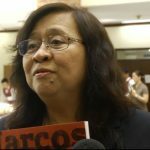 Robles, however, said the Marcoses should acknowledge the atrocities that occurred during the late dictator’s rule. “Will I say sorry for the thousands and thousands of kilometers [of roads] that were built? Will I say sorry for the agricultural policy that brought us to self-sufficiency in rice? Will I say sorry for the power generation? Will I say sorry for the highest literacy rate in Asia? What am I to say sorry about?” Marcos said in an August 2015 interview. But Robles criticized Marcos for having a “selective memory,” choosing to leave out any mention of repression and torture under the late dictator’s rule. She added that the younger Marcos himself should not be let off the hook, in response to some critics who say that he should not be made to pay for his father’s sins. “Let me put that into context. Bongbong Marcos was governor in 1985. The Commission on Human Rights gave me data on extra-judicial killings in different provinces. In the province of Ilocos Norte, there were only 2 extra-judicial killings: one in ’85, one in ’86, and who was the governor? He was. The governor’s in charge of peace and order. So did he not know?” Robles said. 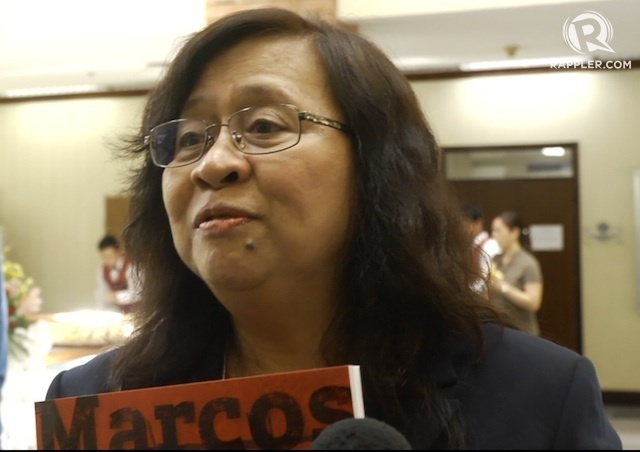 While she did not speculate on the book’s impact on the upcoming polls, Robles said she hopes that the book will help young voters understand the historical context of grievances against Marcos, and to elect leaders whom they believe will work for the good of the country. Robles added that the book aims to warn people about the price of a potential new dictatorship. “When [leaders] promise, ‘Give me power, and I will do this for you in 6 months’ time,’ you better stop and pause. Because once you give a person power, it’s not as easy to get it back,” she said.